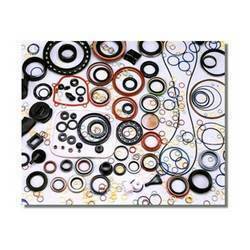 Leading Exporter of rubber o rings & seals from New Delhi. As a well-known manufacturer and supplier, we offer our clients Rubber O Rings & Seals. Our product is manufactured using superior grade rubber polymers. Moreover, offered products are available in several specifications like colors and sizes to fulfill the diverse requirements of the customers. In addition, our products are known for high resistance to oil and extreme temperatures and excellent physical properties. Looking for Rubber O Rings & Seals ?